The first ever attempt by BERETTA to produce a .5'56 weapons system took place in the early '70s, when many of the NATO countries were switching from .7'62-NATO to 5'56-NATO, shamalessly following the steps of the United States of America in the direction. This rifle had its concept developed after a strong study of other .5'56 rifles designs, such as the american AR15/M16 and AR18, and maybe also the early belgian FN CAL.It featured a fixed stock and a Safe- Semi-auto- Full-autofire Trigger Group. The barrel had some compensation holes, to help reduce recoil. Can be fitted with flash suppressors, a bayonet AND a variety of scopes and optics, such as an early kind of Starlight scope. A folding bipod was able to be placed under the barrel. Ammnution magazines had a capacity of 5, 20 and 30 rounds; the 5 rounds magazines are also available "as them are" for the AR70-SPORT on the civilian market, and a 20 rounds magazine, with capacity reduced to 10 by the factory application of a unremovable blocking device is also available on the italian civilian market (at least, it WAS, as the AR70-SPORT is no longer produced from many years). It was a good design, and almost a FAILURE. 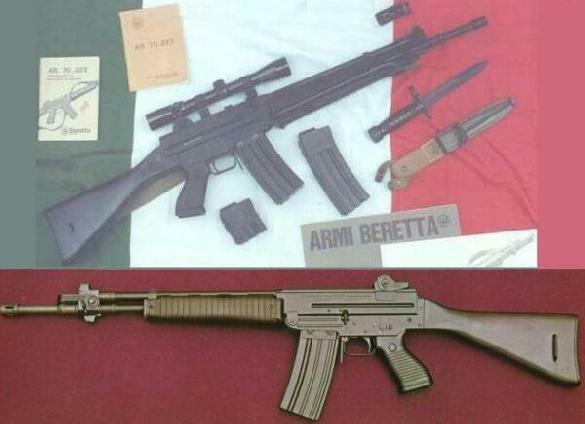 The Italian Army had not opened "official trials", just showed "interest" in new .5'56-NATO (complete switching from 7'62 to 5'56 in the italian army took place just at the end of the '70s), and most part of the Infantry didn't got this new rifle. Just a very small number of units were equipped with this rifle, while still most of our army kept the BM-59 (italian M14). Furthermore, it wouldn't have a very long service life, because it had no STANAG provisions: it was not capable, as an example, to fit M-16 style ammunition magazines. So, BERETTA had to offer this rifle to foreign countries. According to some lines which I read on the PROBERT ENCYCLOPAEDIA, Indonesia still keeps it as their main assault rifle, even if it's completely obsolete (as an AR18 would be). The AR70 and SC70 are however currently in service with the VAM (Vigilanza Aeronautica Militare= Air Force Security Regiment), which is NOT a combat unit: never and ever, in case of a war, the VAM would be sent to the line of fire, because VAM's purpose is to ensure maximum safety, in time of peace and war, to Italian and NATO (in Italian territory) main interest base.